IRPRESUNIV.ORG, CIKARANG - International Relations Major Association in President University (PUMA IR) conducted a political discussion platform called “NGOMPOLS” (Ngomongin Politik dan Sosial) for the student in President University in Charles Himawan Auditorium, President University. NGOMPOLS is a biannual event that held by President University Major Association in International Relations which its purpose to increase the students’ interest in the scope of social & political issues, encourage the students to pour their political perspectives & aspirations in the platform and also improve the students’ critical thinking. Even though NGOMPOLS is an event that is held twice a year, but “NGOMPOLS 1.0 2019” had a significant difference from “NGOMPOLS 2.0 2018”, because this year NGOMPOLS present the moderator and speaker as someone not from the lecturers of International Relations Study Program, but from the students of the study program. NGOMPOLS 1.0 2019 invited two International Relations Student, Karl Gading Sayudha from Batch 2018 as the moderator and Muhammad Ilham Razak from Batch 2016 as the speaker. 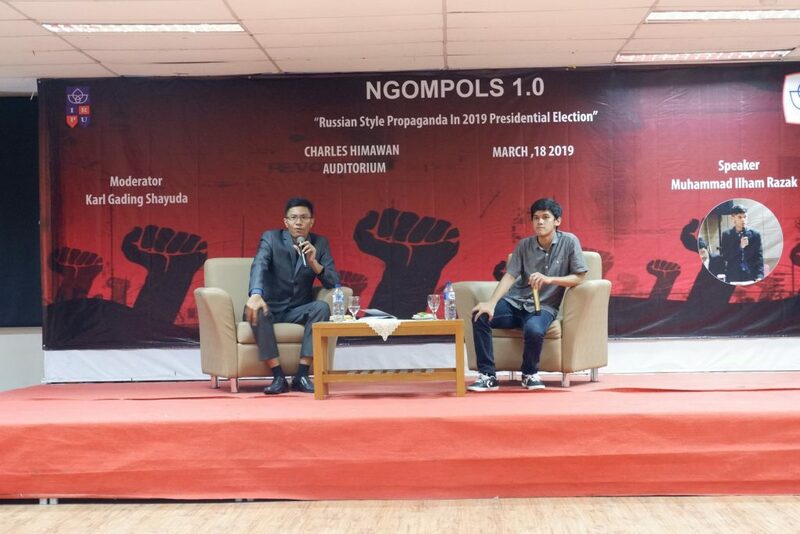 NGOMPOLS 1.0 2019 brought the theme of “Russian Style Propaganda in the 2019 Presidential Election” the event opened by the beloved lecturer of International Relations study program, Drs. Muhammad A.S Hikam MA., Ph.D. He appreciated the committees' hard work and also gave several suggestions for the event. After the opening remarks, Karl Gading Sayudha as the moderator of this event reminds the audience to vote on 17th of April 2019 because it is important for our state, and before he invited the speaker, he also told the audience to stay calm and respect other perspectives during the politic group discussion and finally the moderator invites the speaker to the stage. Muhammad Ilham Razak from batch 2016 as the speaker of this event, explained the theme of NGOMPOLS 1.0 2019 which is “Russian Style Propaganda in the 2019 Presidential Election”, he explained about ‘firehose falsehood’, he mentioned four characteristics of firehose falsehood which are high volume multichannel, rapid continuous and repetitive, lacks commitment to objective reality, and lacks commitment to consistency. After he explained the materials, he asked several questions to the audience, and the audience answer the question with vigorously. The situation in the discussion session ran smoothly, every student had respected others opinions and perspectives, they exchange ideas together, discuss who created the fake news, why they created the fake news, what is the purpose of them, how to prevent them and what we should do for our next generation in order to make them to not fall for the fake news. This event attended by approximately 75 students, and International Relations study program beloved lecturer Drs. Muhammad A.S Hikam MA., Ph.D. & I Gusti Dharma Agustia MSc. NGOMPOLS 1.0 2019 not only attended by International Relations students, but also several students from Management study program & Elementary School Teacher Education, just because they are not thrashed out about politics in their study program it does not mean that they were not active in the discussion. Before the Master of Ceremony, Aulia Valentin close the event, she announced three awards for the audience which are The Best Question, The Best Answer and The Most Active. 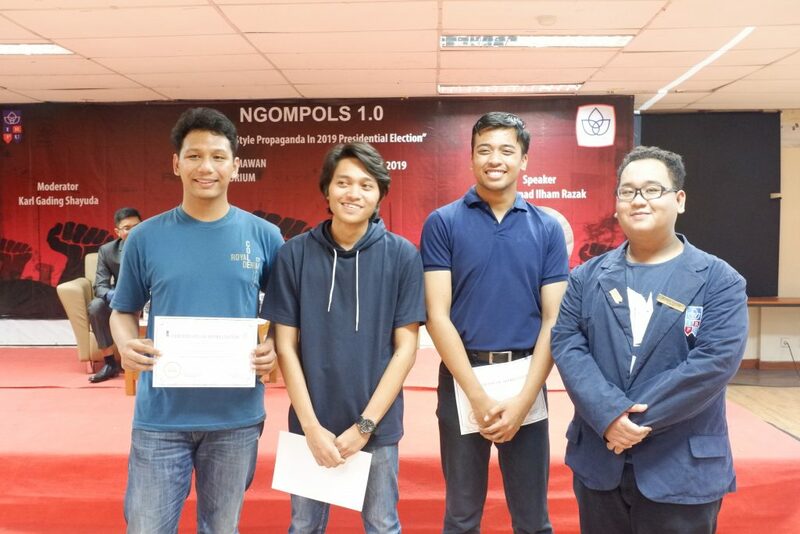 The Best Question won by Dimas Pranata from batch 2018, Sultan Gilbert from batch 2017 won Best Answer and The Most Active in NGOMPOLS 1.0 2019 won by Giffariel Novansyah. Aulia Valentin continued by thanking the moderator, speaker and reminded the audience to use their rights as the citizen of Indonesia in 17th of April. Chairperson of PUMA IR, Muhammad Hibban gave the token of appreciation to the moderator and speakers, the project manager of NGOMPOLS 1.0 2019, Darrel Xavier also give the token of appreciation for the audience who won the Best Question, Best Answer and The Most Active. And finally, the event ended with photo session with the moderator and speaker. This entry was posted in Events, Press Release. Bookmark the permalink.